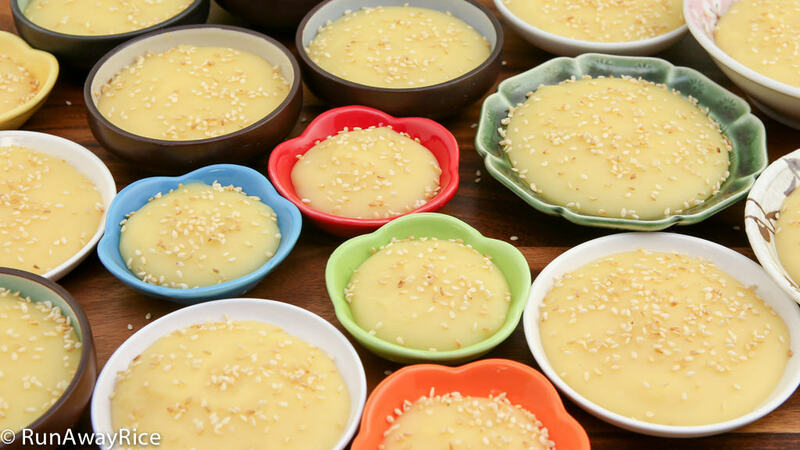 Make Mung Bean Pudding (Che Kho), a silky mung bean pudding set into a soft, sweet cake with this easy recipe. 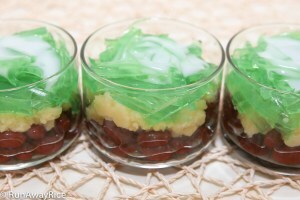 Mung Bean Pudding (Che Kho) is a popular Lunar New Year’s snack and enjoyed casually as finger food. Small dishes of the hearty pudding are made in advance and served to visiting family and friends bringing well-wishes and gifts during this festive time of the new year. This dessert is easy to make and the recipe is really straightforward. 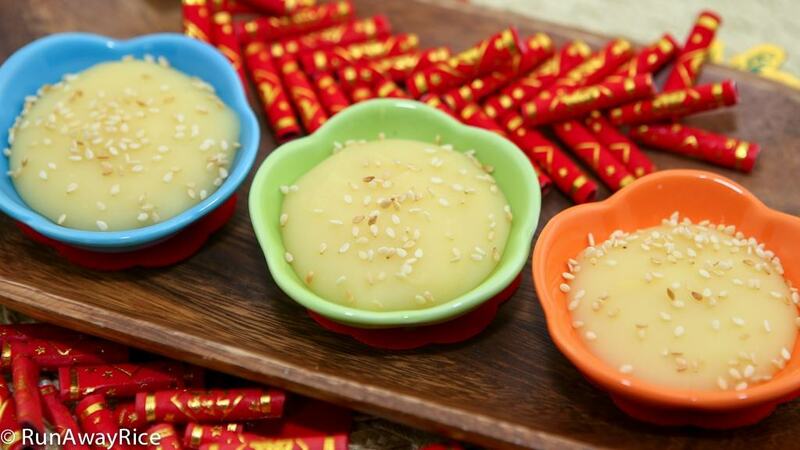 Whip up a yummy batch today and have this sweet treat ready to serve to your guests this Lunar New Year. Enjoy! The dry mung bean can be soaked anywhere from 2 hours to overnight. Adjust the sugar levels to your taste. The dessert is intended to be sweet. For a less sweet pudding, use 1/2 to 3/4 cup sugar. For a sweeter pudding, use 1 1/4 to 1 1/4 cups sugar. 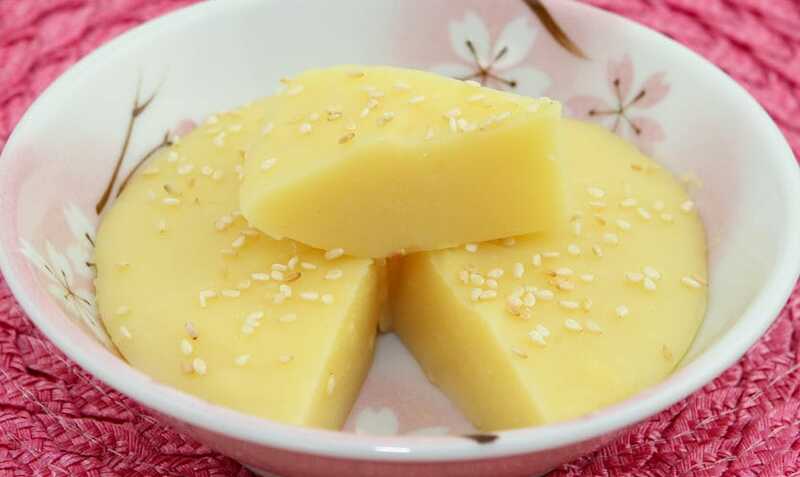 Stir frequently when cooking the puréed mung bean. Be sure to scrape the bottom of the pan to prevent any crust from forming as this will make the pudding lumpy. If a crust continues to form, reduce the heat to Low. When cooking the pudding, be sure not to cook off too much of the water such that the pudding is stiff. The pudding should still have the ability to ooze or flow slowly. When spooning the pudding, it should flow slowly, filling out the dish. The method of cooking off the liquid slowly stabilizes the pudding and prevents it from going moldy faster. To store, cover the cakes with cheesecloth and store at room temperature for up to 5 days. Do not cover with plastic wrap as this locks in moisture and breeds mold. Optionally, cover and store in the refrigerator for up to 2 weeks. To serve, allow to come to room temperature. Wash the mung bean by swirling in cold water. Pour out the wash water and repeat the process 2 more times or until the water is mostly clear. Fill the bowl with water and let soak for 2 hours. After soaking, wash the mung bean one more time and then drain. Transfer the beans into a large pot. Add the salt and water. Stir to level-out the beans. Cover the pot with a lid and bring to a boil over High heat. After it comes to a boil, reduce the heat to Low. Skim off the foam from the top and discard. Cover the pot and let cook for 20-25 minutes or until the beans are soft and creamy. Transfer the cooked beans into a blender. Add the sugar and vanilla extract. Blend on High speed for 30-45 seconds or until smooth. Pour the puréed mung bean into a large non-stick pan or skillet. Cook the beans over Medium Low heat for 20-25 minutes stirring frequently. Cook off the liquid until it’s a pudding. Transfer the pudding into shallow bowls or dishes using a cookie scoop or large spoon. Sprinkle roasted sesame seeds on top of the pudding. Allow to cool and set for 2 hours. 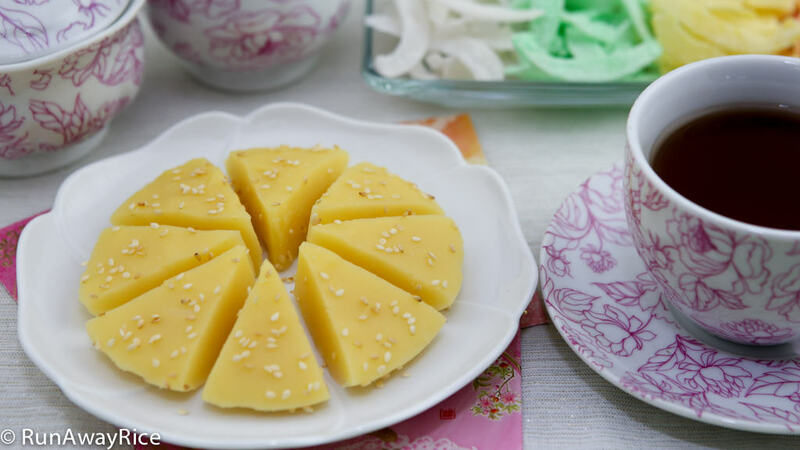 To serve, cut the Mung Bean Pudding into bite-sized pieces and enjoy with hot tea. To store, cover the cakes with cheesecloth and store at room temperature for up to 5 days. Do not cover with plastic wrap as this locks in moisture and breeds mold. Optionally, cover and store in the refrigerator for up to 2 weeks. trang: you don’t suggest using sprouted mungbean. is there a reason?